The good thing is Mike from SUPERAntiSpyware has generously sponsored with a lifetime license to giveaway. So one lucky reader would get an opportunity to win that license, And thank you very much Mike for that license. Tweet this post and leave a comment here on or before 19th May 2010 to participate on the giveaway. 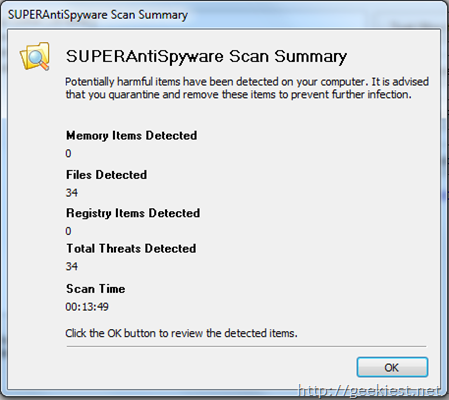 SUPERAntiSpyware version 4 was released on 03/06/2008 this was a major upgrade from their previous versions. And the current version is version 4.36, which was released on 4/29/10. Though the name suggests that it is an antispyware but it is capable of eradicating the following type of threats from your computer: Spyware, Adware and Remove Malware, Trojans, Dialers, Worms, Key Loggers, Hijackers, Parasites, Rootkits, Rogue Security Products and many other types of threats. Schedule either Quick; Complete or Custom Scans Daily or Weekly to ensure your computer is free from harmful software. 3. 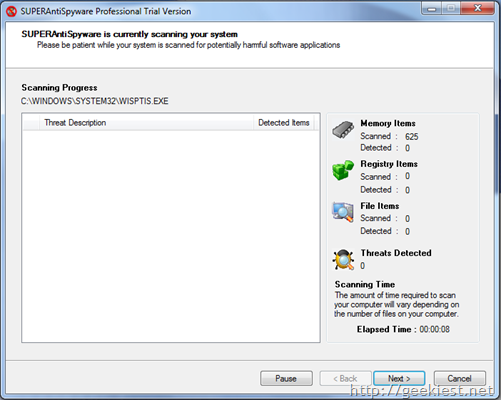 SUPERAntiSpyware Portable Scanner: The scanner features complete scanning and removal engine and will detect AND remove over 1,000,000 spyware/malware infections. 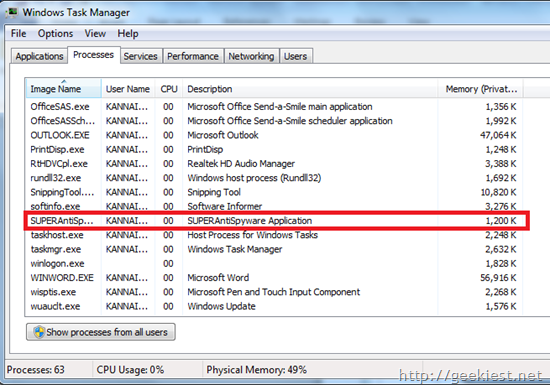 The scanner does NOT install anything on your Start Menu or Program Files and does NOT need to be uninstalled. The scanner contains the latest definitions so you DO NOT need Internet Access on the infected system to scan. From above you may have understood the main difference between the SUPERAntiSpyware free and SUPERAntiSpyware pro. 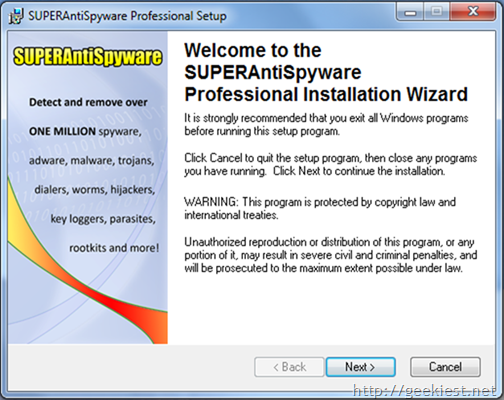 SUPERAntiSpyware Professional features highly advanced Real-Time Protection to ensure protection from installation or re-installation of potential threats as you surf the Internet. Though you download the EXE file from their site just before you start installing .it prompts to update the database to check for latest updates, this is really good as you are sure to get the latest and updated protection. This is also good in case if you have an old installer this would make sure you get updated before you start the scan. 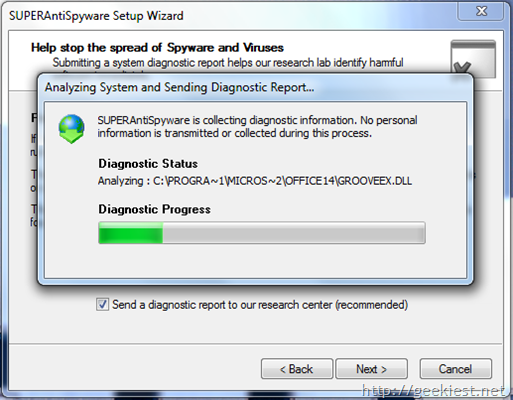 Once the update is done the installation takes less than a minute which includes a diagnostic report analysis and submission to the SUPERAntiSpyware research lab. 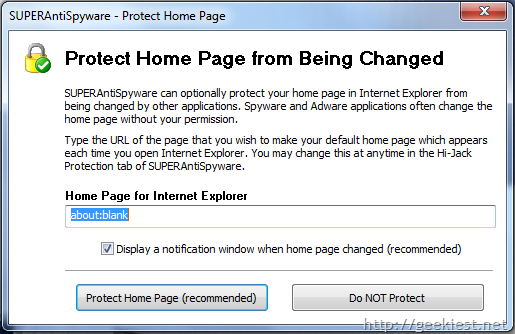 Unlike many applications which tend to change the homepage of your browser, SUPERAntiSpyware prompts a unique and most desirable question of protecting the homepage from being changed. It also monitors your browser setting and warns you when there is an attempt to change the current homepage. The user interface is very simple and intuitive, both expert and a novice user will have no problem handling such a simple yet powerful interface. The left pane shows the available drives including internal, external hard drive, USB, DVD DRIVE. And the right pane lets you choose what type of scan you intend to perform on the selected drives. I wanted to perform a full scan on the 10 of the 12 available drives; the scan was really fast and accurate, the result returned was precise. Moreover it just took 13.49 minutes to perform a full scan on my 1TB hard disk with more than 400GB of data. 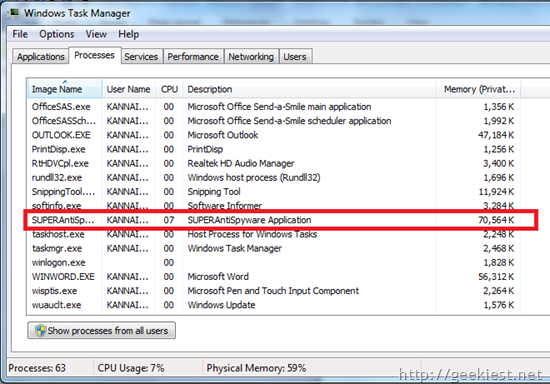 The best thing is SUPERAntiSpyware gives you a detailed report on the types of infections on your system. From the scan if you think any of the file detected by SUPERAntiSpyware as spyware but in reality it is harmless you may add the item to the trust/allow item, manage allowed items. 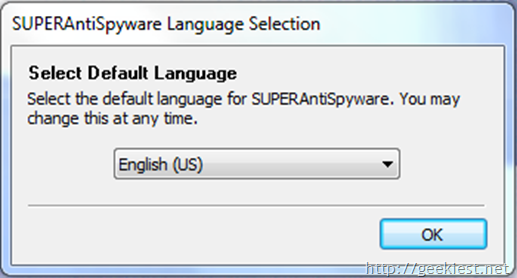 You may also report to SUPERAntiSpyware lab that the file is false positive, so that on future if SUPERAntiSpyware finds this file really as false positive then it wouldn’t term it as a spyware. If you are not sure that what type of threat the detected item poses to your system you may look to SUPERAntiSpyware database to help you in understand it in a much better way and decide if you want to keep it or eradicate it. 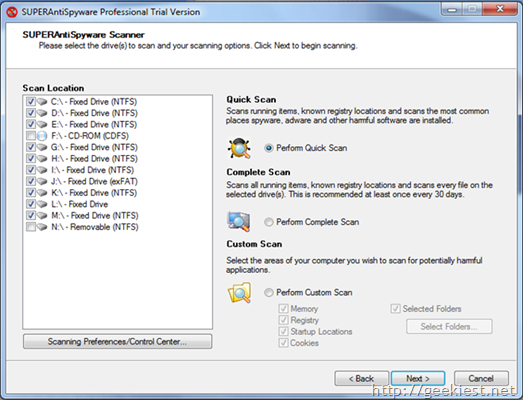 Once you scan and remove the spyware the SUPERAntiSpyware prompts you to reboot the computer which you may decide depending on the type and tendency of work you are carrying out at the moment, but I would recommend you to reboot immediately for avoiding any further infection and complete the removal process. 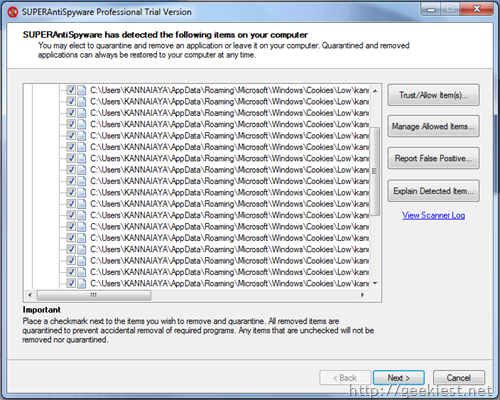 One of the most unique and powerful feature of SUPERAntiSpyware is to perform a repair function which allows the user to recover/repair settings frequently fractured by malware, and which are often not recoverable in spite of removing the malware, these are few possible Repair that could be carried out; broken Internet Connections, Desktops, Registry Editing and more with the unique Repair System. Light on System Resources and won't slow down your computer like many other anti-spyware products. And built to work alongside of your traditional antivirus/internet security suite. Thus I keep admiring at this beauty, and SUPERAntiSpyware has been an integral part of my rescue kit for a long and I would definitely recommend it to one and all. More good news is now the subscription of the pro version is just 29.95$ and if you would like to make it a life time subscription just pay some 9.95$ so for just 39.90$ you get this powerful tool for lifetime, so why wait till you face a problem, instead be smart and buy this beforehand. Hello all I am Shiva, and do not put me away from you by saying I am a techie guy or something like that. I am as normal as you are, and I am in the process of learning and coping up with technology. Interest in learning new things daily has led me and inspired me to help people who need to know about latest development in the field of computers as I do .my motive is simple give others at least half of what you got. And help others as much as you can. i was first attracted towards the hardware of computers, then little by little I started learning about software’s. And I am still in the process of learning and in the meantime I wish to pass on the knowledge that I acquire to others.